This will be our fourth tour to Peru. 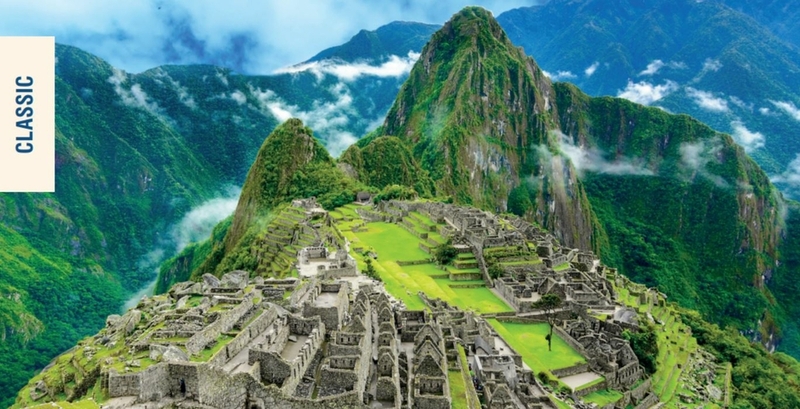 Peru has many highlights, not least of which of course is Machu Picchu, one of the seven wonders of the world in which we are able to spend two days, but there are many more highlights and some of the most renowned railway journeys in the world. Because Peru is much frequented by Americans, standards of accommodation and food are excellent and clients from previous tours have all commented on a wonderful and memorable experience. Tour Manager: For group size up to 14 there will be a local tour manager. Over 14 and Angelina Pons will also accompany the tour. Day 1 Friday 1 November Flights with KLM to Amsterdam from many UK regional airports. We all meet up for the direct flight from Amsterdam to Lima, Peru. Whichever flight you choose you will be met on arrival at Lima airport by our local representative and transferred to the hotel. Overnight in Lima. Day 2 Saturday 2 November (B) A chance to recuperate, find your feet and explore the area close to the hotel. Past experience has shown that this rest day is very much appreciated by clients. Overnight in Lima. Day 4 Monday 4 November (B) After breakfast we have an transfer to Lima airport for our internal flight to Arequipa. This is a UNESCO world heritage city and probably the best preserved colonial Spanish town in the world. The rest of the day is free to recuperate and to explore this fascinating city dominated by the 5,822 metre-high Volcan Misti. The city is at 2,350 metres above sea level, so you will be starting your acclimatisation to altitude. Overnight in Arequipa. Day 5 Tuesday 5 November (B) Today we have an escorted tour of the city, beginning with the extraordinary architecture of the Convent of Santa Catalina, opened to the public in 1970 after more than 400 years of cloistered religious life. The strong, vibrant colours make this a photographer’s dream. Other sights include the Plaza de Armas or Main Square, the Cathedral and the Church of La Compañia. We cross the city and Chili River to enjoy the Carmen Alto viewpoint before visiting the “Mundo Alpaca” where you can get close to Llama and Alpaca, see how the wool is sorted and how the finest fibre in the world, Vicuña wool, is brushed and processed. Finally, we will also visit the San Camilo market, built at the end of the 19th century based on the designs of Gustave Eiffel. Expect to see witchcraft stalls, people selling herbs for various diseases and an astonishing variety of potatoes! Overnight in Arequipa. Day 6 Wednesday 6 November (B,L,D) Three great volcanoes dominate the area north of Arequipa: Chachani, Misti and Pichu. Our vehicle ascends the slopes of Chachani to reach the nature reserve of Pampa Cañahuas (4,000 to 4.500 metres) where you may see Vicuñas (a native alpaca species) as well as a variety of plants. We are on the altiplano now. This is the great high plateau of the Andes, cool and bleak with enormous skies. Our journey passes through Patahuasi, High Sumbay, Vizcachani, Toccra, Chucura and Patapampa where we are at 4800 metres with a vast panorama of the Andes before us. Our overnight stop is at Chivay in the Colca valley. Day 7 Thursday 7 November (B, Packed lunch, D) An early departure so as to be able to see one of the most memorable sights of our tour – the awesome Colca canyon with Condors taking off from their nests into the abyss. Returning to Chivay we then pass through the villages of Pinchollo, Maca, Achoma, Yanque and stop at the viewpoint of Antahuilque to see the pre-Inca terraces or Choquetico platforms, complete with hanging tombs. There are high lakes and wild scenery as we travel to the city of Puno. Overnight in Puno. Day 8 Friday 8 November (B, L) Today we explore Puno with a local guide, and in particular Lake Titicaca and the Uros Indians who live on rafts on the lake. The rafts are made from reeds, and three to ten families live on each one. Most roofs are made from totora reed carpets, though some families have replaced their traditional roofs by metal ones. The Uros call themselves Kotsuña, “the lake people”, and their origins go back to before the Incas. In the afternoon we have a coach tour to Lampa where the main attraction is the church of Santiago the Apostle which contains an exact replica of Michelangelo’s “The Pietà”. The mould of the sculpture was taken from the original in Rome, and was supposed to be destroyed after the copy had been made. Luckily this did not happen, so when the original statue in Rome was partially destroyed, the mould was used to restore the damage. Overnight in Puno. Day 9 Saturday 9 November (B) Today we undertake one of the most memorable train journeys in South America, from Puno to Cusco. Operated by PeruRail, the train is called the Titicaca, and is a true luxury train, opulently furnished and serving fine food as you pass by Lake Titicaca and over the altiplano to Cusco. Expect to see llama herders on motorbikes! Overnight in Cusco. Day 10 Sunday 10 November (B) Cusco is another world heritage city, originally built by the Incas. Our exploration will start with a visit to their main fortress, the fortress of Sacsayhuaman, a colossal structure of enormous stones, carved and fitted together with incredible precision. At Qenqo, the religious centre, we will enjoy a panoramic view of Puca-Pucara, the Red Fortress and then we visit Tambomachay which has aqueducts, canals and waterfalls that run through the terraced rocks. Our tour continues in city itself at the main square, dominated by the Cathedral with its exquisite vestibules and priceless paintings from the Cusco School of the 17th and 18th centuries. Finally, we visit one of the most impressive buildings of Incan Cusco, the Qoricancha (meaning the Golden Temple) – a temple dedicated to the worship of the Sun God, whose interior walls were said to have been covered in gold. Overnight in Cusco. Day 11 Monday 11 November (B, L) This morning we head into the Sacred Valley of the Incas to Chinchero village, set at 3,772 metres above sea level and famous for the extraordinary beauty and quality of its textiles, as well as its Sunday fair, when local people dress in colourful traditional outfits travel down from their villages to trade their goods. Continue to the archaeological site of Moray where circular agricultural terraces descend 150 metres, then to the salt pans of Maras, used since Incan times and offering amazing contrasts of brilliant white on green. Finally, we will visit one of the last remaining Incan towns, Ollantaytambo, once guarded by a massive fortress. Part of the large archaeological complex used to serve as a wayside inn for royal delegations on long journeys. Overnight in Cusco. Day 12 Tuesday 12th November (B, L) Today we come to one of the highlights of our tour, a visit to the historic sanctuary of Machu Picchu. A short coach journey will take us to the station outside Cusco from where we take our train to Machu Picchu, enjoying spectacular views along the way. A mini-bus will take us up the winding Hiram Bingham highway to the entrance. Rediscovered by Hiram Bingham more than a century ago, Machu Picchu is considered one of the wonders of the world. Its architectural beauty, spectacular setting and its enigmatic structures make it the experience of a lifetime and we have an excellent guide to tell us the fascinating story of this iconic location. Overnight in Machu Picchu village. Day 13 Wednesday 13 November (B, L, D) You may wish to return to Machu Picchu accompanied by our guide, possibly to walk up to the Sun Gate, something several previous groups have done. Alternatively, relax and enjoy the village activities before boarding our afternoon train to return to Cusco. Overnight in Cusco. Day 14 Thursday 14 November (B) Today we transfer by air from Cusco to Lima. Overnight in Lima. Day 15 Friday 15 November (B) Free time to relax. Early evening accompanied transfer by coach to the airport for flights to the UK departing 21.05 to Amsterdam for onward connections to UK airports. This tour has been designed to gradually increase the altitude to give you time to adjust. It is important to note that Puno and Cusco are at high altitude and that altitude sickness in the form of breathlessness and headaches is possible whilst acclimatising.